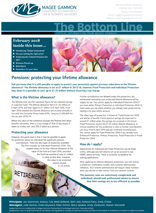 This season’s newsletter highlights that it is still possible to protect your pension against previous reductions in the lifetime allowance and explains how to apply for protection. It also includes information on the new General Data Protection Regulation (GDPR) which comes into effect on 25th May 2018 and how to prepare for its introduction, as well as information on the HMRC‘Simple Assessment’ system which was rolled out last September. And of course, we’ve not forgotten the all-important business round-up and reminders for your diary for the coming months.